Bedside companion, certainly not to be read all at once, of clips, stories, impressions, poems, and narratives that tell the history of black art that has enriched the globe, not just the States, and of the big fall into drugs and crime and urban blight. The more famous contributors include Alexander Hamilton, W.E.B. 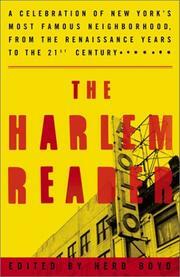 Du Bois, James Weldon Johnson, Marcus Garvey, Duke Ellington (“Nights at the Cotton Club”), Langston Hughes, Adam Clayton Powell, Ossie Davis and Ruby Dee, Gordon Parks Sr., Ann Petry (from 1946’s The Street), Sidney Poitier, Claude McKay, Piri Thomas, John Oliver Killens, James Baldwin (“Fifth Avenue Uptown: A Letter from Harlem” from Nobody Knows My Name), Ben E. King’s song “(There Is a Rose in) Spanish Harlem,” Malcolm X (from The Autobiography of Malcolm X), Maya Angelou (on Castro in Harlem), Chester Himes (from Cotton Comes to Harlem), and editor Boyd himself (Autobiography of a People, not reviewed; African and African-American history/College of New Rochelle). (Missing: Ralph Ellison, Melvin B. Tolson’s Harlem Gallery.) This is a book, Boyd says, that “stretches beyond the halcyon twenties into the world of the learned scholars, novelists, and ordinary ‘griots’ so that you can feel Harlem’s unique pulse, see those hues of humanity, smell the seductive aroma wafting from a thousand restaurants and street vendors or hear the countless tongues trying to talk above the music blasting from boom boxes and store speakers.” There are also charming excerpts from works by relative unknowns, such as Cintra Williams’s fierce deconstruction of “Chris Rock at the Apollo” and Michele Wallace’s “Memories of a Sixties Girlhood: The Harlem I Love” (from her Invisibility Blues), an antidote to Harlem on My Mind and Piri Thomas’s Down These Mean Streets. Richly intelligent, hustling energy throughout.